Props live in the world of the visual design created by the scenic designer used to establish the stage setting for the play. They are the details fleshing out the architecture to define the characters in the play, set the time period, complete the action needed within the structure of the play, and complete the “bridge” between the characters on stage and the reality of life objects. A good analogy to define “what is a prop?” has been likened to the real life situation of when a person moves from one home to another. A moving van pulls up and all the contents of the home are loaded in the van and it drives off to be unloaded into the new house. The house is the scenery. The scenery includes the actual walls, floors, ceilings, doors- the architecture of the house. This does not move. It is stationary and permanent. The items boxed up, covered in pads, and carried out to the moving van when a person is changing residences would all be considered the props. Props live in the world of the visual design created by the scenic designer used to establish the stage setting for the play. They are the details fleshing out the architecture to define the characters in the play, set the time period, complete the action needed within the structure of the play, and complete the “bridge” between the characters on stage and the reality of life objects. A good analogy to define “what is a prop?” has been likened to the real life situation of when a person moves from one home to another. A moving van pulls up and all the contents of the home are loaded in the van and it drives off to be unloaded into the new house. The house is the scenery. The scenery includes the actual walls, floors, ceilings, doors- the architecture of the house. This does not move. It is stationary and permanent. The items boxed up, covered in pads, and carried out to the moving van when a person is changing residences would all be considered the props. 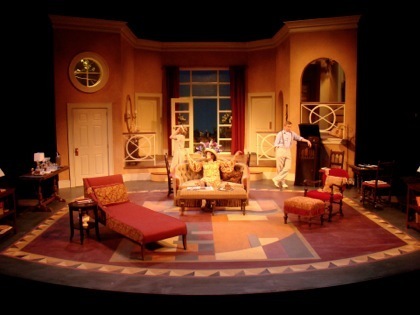 Adding the furniture props and stage dressing is what brings the space to life. Props bridge the space between the actor and the setting, making it human and bringing it alive, giving it dimension, color, character and clues to the world of the play. Click to move to next “chapter”: Who Does What? 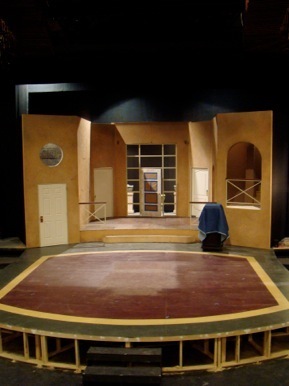 Stage setting following set dressing of house interior, yard area, and entrances. Seven Guitars designed by Bruce Brockman, courtesy of UWM Theatre Department. Stage setting following set load-in and prior to prop dressing. 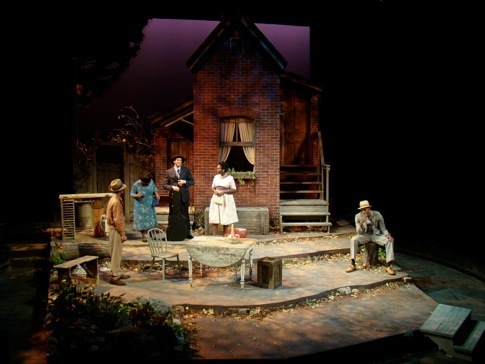 Properties production, of all the areas in the production side of doing theatre, is probably the most collaborative with the designers and director. While some information is available from the drawings designers produce and from rehearsal, the prop shop often researches and creates much of what is placed on stage directed by their sense of the overall design sensibility and an understanding of time period, place, and an interpretation of character from the rehearsal process. The props are all the non-permanent items. Think of what would be put in that moving van – dishes, lamps, chairs, books, pictures, furniture, blankets, drapes, rugs, letters, office supplies, appliances, lawn tools – all the “stuff” people need in their everyday living and utilize to furnish their homes. It can be either personal (a book on Egypt) or non-specific (a pillow) but every item says something about who owns that item. Even the non-specific pillow tells us something. Is it a bed or sofa pillow? Feather or foam? In a pillowcase or ticking cover? Clean or stained? Each item is a small clue into who the owner is, giving insight into the character of the owner. Making the choices about what it all looks like and finding or building those items is what a prop person does. 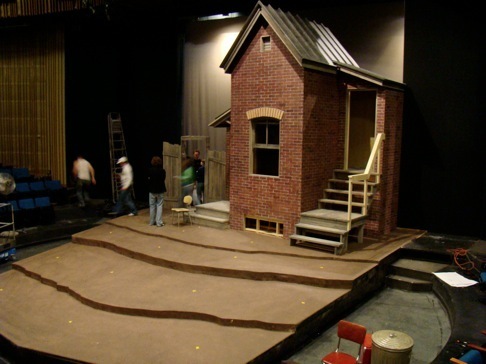 Props can be broken down into several easy categories and most prop shops work with three categories – Hand props, Set props, and Stage dressing. 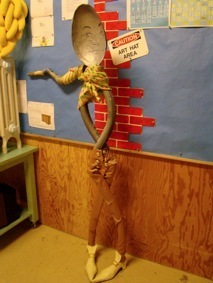 “Spoon” created in Seattle Children’s Theatre prop shop. Preview set shot- all dressing complete and scenery finally done. Note dressing in backing areas of garden, front door, and upstairs hall.